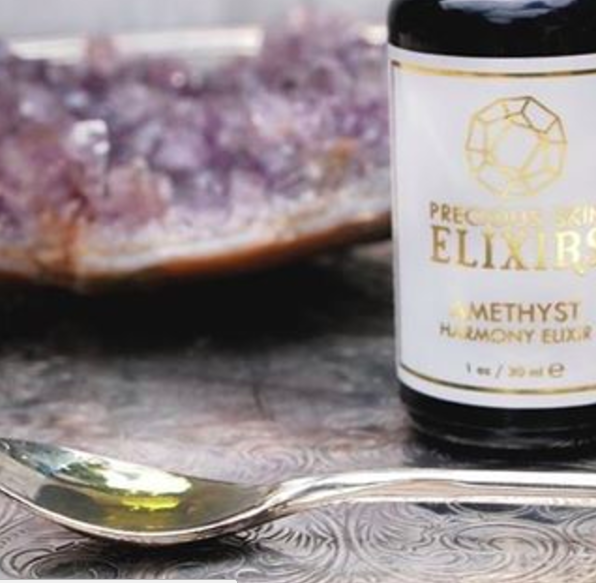 When we imagined creating a collection that encompasses the magical and transforming benefits of precious metals and gemstones we immediately thought of Precious Skin Elixirs. Founder Marissa Bethoney has found a way to capture luxury in a bottle and it’s better than we could ever dream up. 1. You were a jeweler before transitioning to skin care. Can you tell us what inspired you to make this sizable shift? I absolutely adored designing and making jewelry for about 10 years. However, the fashion industry is so fast-paced and requires a lot of travel, so when I started my family I decided to scale my business way down in order to give the most energy to my babies. Throughout the early years of motherhood I took up the study of herbal medicine and made a deep-dive into the healing arts, learning Reiki, practicing meditation, and discovering the healing energies of the very crystals and gemstones I had been working with for years! As my body had changed with pregnancies, my skin started to freak-out and I decided to solve my acne and dryness with my new-found knowledge of plant medicine and the amazing ingredients that come straight from mother earth. The result? My skin had never looked better in my life. 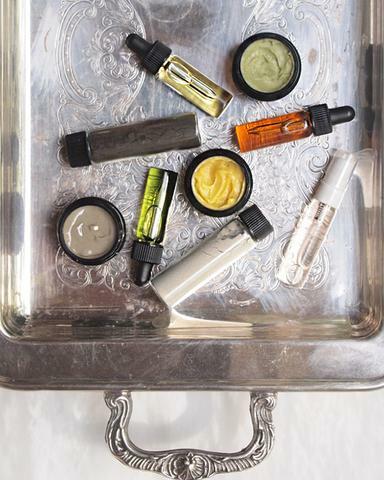 I couldn’t wait to share these potions and raise the bar on skin care, elevating “routine” to a mindful ritual that brings joy, honors our sacred beauty, and supports our well-being with completely pure, natural ingredients. 2. Where do you find inspiration for your products? How do you choose your ingredients? Inspiration comes from so many directions. Throughout my day I’ll make mental notes about a certain problem that needs solving, or an herb I keep hearing about. It’s when I am quiet and still that the ideas start to form – then t’s playtime in the studio and that’s when the magic happens! Working with natural ingredients is a joy and a challenge. Many times a recipe will work in my head and heart, but end up being completely different once created. That’s also part of the magic – the alchemy of the process. I choose my raw ingredients based first on purity and if it can be sustainably procured. I won’t work with anything that is not of the most vibrant, efficacious quality. The sourcing process is not easy and it’s a balance between creativity in formulation and the reality of what’s available based on the high standards we maintain as a company. 3. What is your most beloved product by you/your customers? This is such a difficult question because each product is loved dearly depending upon who you ask! We receive a lot of feedback on the Sterling Honey Polish delivering incredible results to those with sensitive or dry skin. 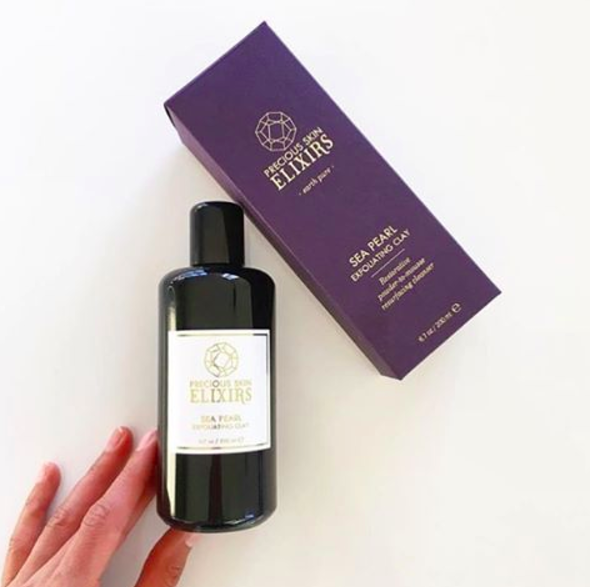 The Tourmaline Radiance Elixir has been getting a lot of love lately too for the noticeable results our customers see in their complexions’ brightness and suppleness. I’m partial to the Amethyst Harmony Elixir for my skin’s needs. This was the first face oil I created to keep my blemish-prone skin in a true state of harmony. The beautiful oils in this blend are high in linoleic fatty acids which are amazing for acneic skin types. I’d be lost without it! 4. What makes you most excited about clean beauty and this industry? I am beyond thrilled to be part of this amazing movement that’s changing the way we experience our beauty, nourish our body, mind, and spirit, and care for our planet. The clean beauty movement is helping us reclaim and reconnect to the wisdom of nature. My happiest moments are when I receive love notes from customers telling me a certain PSE product is giving their skin incredible results and that they are amazed that something all natural works better than anything they have ever tried. I am overjoyed when customers tell me they are finally getting to a happy relationship with their skin and a deeper connection to themselves through the nurturing self-love a mindful skin care ritual provides. This is why I do the work. Yes it’s fun to create and see a vision come to life, but it’s way more powerful to me when I see the result in the world. There’s the alchemy that happens in the process of creating the products, and then there’s the alchemy – the transformation that each person who uses the product experiences. 5. What does your personal beauty routine look like? Do you have a “desert island” product you could never live without? I start each day with a glass of warm water and fresh squeezed lemon juice. I consider my internal habits part of my beauty routine too! For products, I like to keep to a minimal daily ritual and spend more time indulging a few evening per week. I don’t wash my face in the morning. I simply tone with the Rose Quartz Botanical Mist and massage in the 24 Karat Gold Restorative Balm during the day to keep my skin soft, protected, and nourished. I like to wear eye makeup and lipstick, but stay far away from foundation and powders. My skin just does not tolerate makeup very well, even the gorgeous clean beauty options out there! At night, I remove my eye makeup with the Peridot Cleansing Balm and spend 2-5 minutes giving myself a mini facial massage as I cleanse with Peridot. A steamed cloth to remove the oils feels incredible on my face after a long day. I then double cleanse with the either the Sterling or Sea Pearl depending on what my skin needs. Then I mist with Rose Quartz and apply Amethyst to my damp skin. I love sinking into a hot, salty herb-infused bath once a week with the Onyx Purity Mask slathered on my face and neck. Showing up for myself every night through beauty ritual has created such a positive shift in my life. Taking the time to nurture beauty and show ourselves love is truly transformative. 6. What makes you feel beautiful? I feel most beautiful when my external actions, words, and being reflect my inner wisdom, joy, and peace. When I do yoga, make a healthy meal for my family, take a moment to talk with a stranger in the market…this is when I embody how I’ve come to define beauty. 7. How do you create the difficult balance between work, motherhood and self-care as an entrepreneur? The answer to this is, I don’t! I actually don’t create balance between these things, and it’s been the most freeing thing for me to let go of the idea of having all the elements in balance. I strive for harmony. One area will certainly get more of my energy, but I try to be mindful of shifting directions as I see another area of life needing my attention. Nothing is ever on an even keel, and I’m ok with that. As a mother I’m always willing to drop what I am doing and pick up a sick child from school, kiss a scraped knee, or read that extra story at bedtime. I used to let my self-care suffer, but I have learned that if I’m not taking care of my physical, mental, and spiritual needs then nothing I do is harmonious! 8. Do you have any advice for aspiring female entrepreneurs? The best thing I can say is to be patient. Be patient with yourself, the process, the external factors… So many times I have burned myself out trying to “surge ahead” and make enormous leaps in a single month or year. Cherish your passion and use it wisely. You can’t swallow the ocean in one gulp. 9. Can you share any hints or sneak peaks of things you are working on for future release? I have 2 new products slated for debut in 2017. One of them is a long-awaited body oil…with a bit of a twist! It takes a year or longer to formulate a new product, and I am very happy with the results. I know our customers will be delighted too! Precious Skin Elixir’s 24 Karat Gold is featured in our December Clean Beauty Box, GEM. Learn more about it HERE.